Naidu was an ABVP activist during the Emergency and was arrested and jailed. From pasting party posters to an epitome of political and ideological loyalty who rose to become one of Bharatiya Janata Party's most visible leaders and now India's Vice President-elect, Muppavarapu Venkaiah Naidu has come a long way. Born to a humble agricultural family in Andhra Pradesh's Nellore district, the 68-year-old has served as BJP president, minister in various portfolios and a long-time Rajya Sabha member. It began in the 1970s when BJP's precursor Jana Sangh was a marginal player with little clout in the south and a young party worker kept himself busy putting up posters of stalwarts such as Atal Bihari Vajpayee and L K Advani. Naidu has come a long way since those days of political obscurity. "Coming from an agricultural background, I never imagined I would be here. Agriculture has no proper voice in Indian polity," India's vice president-elect told PTI. "I am very humbled. I am also thankful to the prime minister and all party leaders for their support. I will seek to utilise the vice presidential institution to strengthen the hands of the president and uphold the dignity of the Upper House," he added. Naidu is known for his oratory. A two-term member of the Andhra Pradesh Legislative Assembly, he was elected to the Rajya Sabha three times from Karnataka. He represented Rajasthan in the Upper House of Parliament before he was nominated to the vice president's post by the National Democratic Alliance. Once an Advani protege, Naidu vigorously backed Modi for the prime minister's post before the 2014 elections. He was minister for Information and Broadcasting and Housing and Urban Affairs in the Modi government and earlier also held the Parliamentary Affairs portfolio. In the previous NDA government led by Vajpayee, he had served as Rural Development Minister. The veteran party leader also served as the BJP national president from July 2002 to October 2004 for two consecutive terms. He quit the post after the party's defeat in the 2004 Lok Sabha elections. Naidu was an Akhil Bharatiya Vidyarthi Parishad activist during the Emergency and was arrested and jailed. Naidu considers the loyalty to his party the leitmotif of his political career. He was raised by relatives because a buffalo had gored his mother to death when he was barely 18 months old. He says he considered his party his mother and devoted his waking hours to party work. He has a son and a daughter and several grandchildren. But neither of his children is in politics because they made a pact that the children would stay away from politics as long as he was active in it. So rare were his visits to home as party president that one of his grandchildren would refer to him as ‘TV dada’; she got to see him more often on television. His father was a farmer and he grew up in an environment where he could empathise with the problems of the farmers and the people of backward classes. Before joining active politics, Naidu was much of a social worker. After completing his graduation, Naidu pursued law from Andhra University in Visakhapatnam. His entry into politics was marked by his active participation in 'Jai Andhra Movement' of 1972. In 1974, he became the convener of the anti-corruption Jayaprakash Narayan Chhatra Sangharsh Samiti of Andhra Pradesh. He took to streets in protest against the emergency and was imprisoned. During the Emergency between 1975-77, he remained underground until his arrest. He used to distribute anti-government literature in educational institutions in Andhra and Tamil Nadu. Naidu rose to prominence along with S Jaipal Reddy, who was then in Janata Party, during the campaign by N T Rama Rao. He gained immense popularity because of his outspoken nature and great communication skills. After the Bharatiya Janata Party was formed in 1980, he became vice president of its youth wing. Naidu displayed his leadership skills when he won the Andhra Pradesh assembly elections twice in 1978 and 1983 from Udayagiri constituency. Naidu's oratory skills elevated him to different positions as a leader in the BJP and made him its national president in 2002. He succeeded Jana Krishnamurthy as the national president of the BJP. On 28 January 2004, he was elected unopposed for a full three-year term. Naidu was elected as a member of the Rajya Sabha from Karnataka in 1998. He was re-elected twice in 2004 and 2010 from Karnataka. He served as the party spokesperson from 1996 to 2000. Naidu’s organisational skills were noticed when he came to New Delhi in the early-1990s as its general secretary. There was a time when Naidu and others would campaign against technology and machines. ‘Automation, anti-nation’ was the slogan. 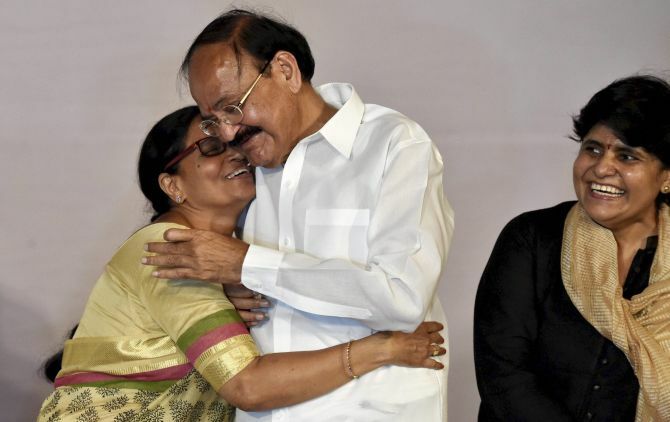 "But political parties and ideologies have to be dynamic and respond to the times,” Naidu would often say later, pointing to how his Marxist friends have failed to adapt. As the first minister of Parliamentary Affairs in the Modi government, Naidu defended the prime minister and the government whenever the opposition targeted them in Parliament. He had also ensured high political outreach by meeting Congress chief Sonia Gandhi when there was a standoff between the government and the opposition in Parliament. Several major legislations were cleared by Parliament when he was Parliamentary Affairs Minister, including the historic Real Estate Act and fast forwarding of the goods and services tax bill. Known for coining acronyms, Naidu termed the mission of the Modi Government as 'MODI- Making of Developed India' which had become the official line of the Centre in its public outreach campaign on the occasion of three years of being in office. As Rural Development Minister, Naidu was instrumental in launching the hugely popular 'Pradhan Mantri Gram Sadak Yojana'. He was re-elected on a BJP ticket when N T Rama Rao swept the polls in the state. But all that has receded into the past. "There is no my party or your party. Now I am a non-party man," Naidu told reporters this morning as the election for the vice president got underway.